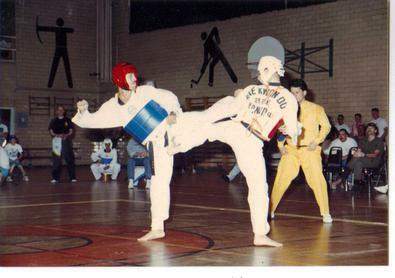 People study Taekwondo for different reasons. Some students want nothing more than practical training to defend themselves. Others want a regular exercise schedule to limber up, build stamina and strength. Some are interested in competition and work hard to become champions. Finally, there are those who take up the classic art of Taekwondo as a way of life. All people in Taekwondo have things in common, whether they are young children, housewives, champions in peak condition, or aging businessmen. What are some of these things? First, every Teakwondo student learns functional exercises, forms and techniques which have continued to evolve over the years. We have worked with physicians to eliminate damaging movements and wasted motion. We studied angles, impacts, and geometry of the body to make traditional patterns efficient, balanced and beneficial. Second, every student learns self control and respect for himself and others. We consider self control of the spirit, having the right directions in life, controlling and focusing the mind and controlling emotions so they do not damage others or self. 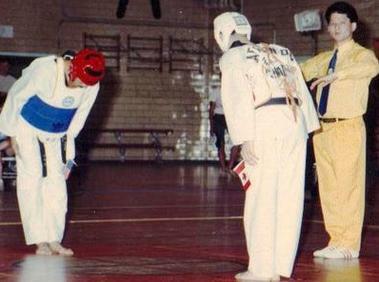 Studying Taekwondo develops confidence and aids in character building. Character building is considered inseparable from the training of the body in the martial arts, which are the arts of war and combat. Taekwondo through physical training and discipline, the student learns to control all movements of their bodies and proper breathing techniques. The instructor paces classes to keep each student pushing and striving in their development to encourage growth in concentration, power and patience as they learn to stand, step, stretch, punch and kick. This is true whether he or she is young or old, beginner or expert. It is true whether the goal is simply to exercise a little bit or to devote one's life to Taekwondo. Each student strives toward continued improvement, in the direction of perfection. With each step forward, vision grows clearer. We see more. We understand more. And we see their is still more room to grow. Like mountain climbers, we scale one peak to discover yet another to conquer. No one has climbed all the mountains of Taekwondo. It is not too hard to teach or learn a big punch or a special kick. but Taekwondo is the whole person in action, forever climbing. In Taekwondo we climb as comrades, not enemies.